The Bigtime Bracket Lounge will be your HQ for first round action of the 2019 NCAA Tournament. Admission is free, and includes complimentary soft drinks, beer and wine. Food and wine will be available for purchase. 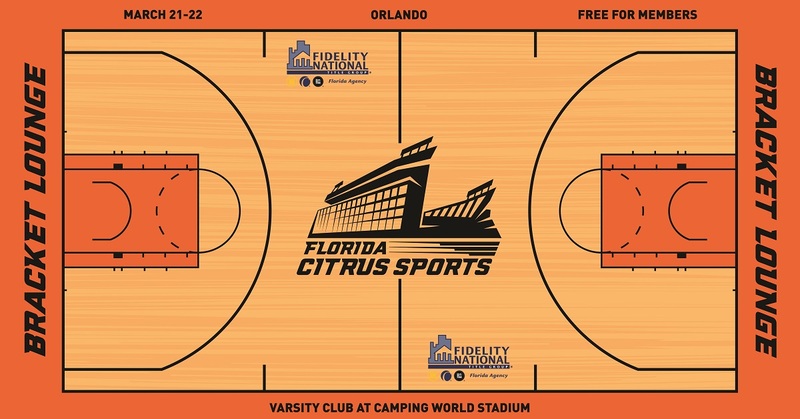 Don’t jump through hoops to follow the 2019 NCAA Tournament from the confines of a cubicle – bring the office to the Varsity Club at Camping World Stadium and enjoy the madness with Florida Citrus Sports! The Bigtime Bracket Lounge presented by Fidelity National Title Group will be your HQ for first round action, complete with power, WiFi and – most importantly – two dozen TVs, so you won’t miss a single bracket-busting upset. Admission is free, and includes complimentary soft drinks, beer and wine. Food will be available for purchase. Choose the session(s) that work best for you!